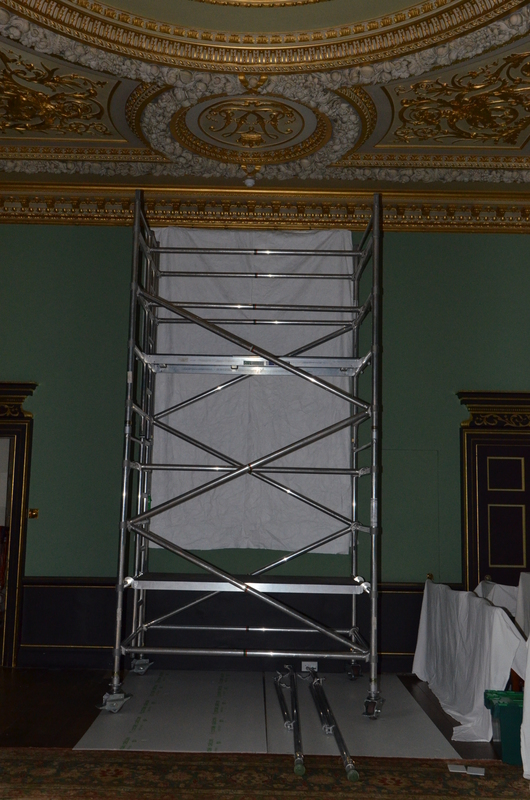 The re-cabling is a really big project at Wimpole, and certain measures have to be taken to keep the Hall safe while it’s happening. Here, in the Grand Dining Room, scaffolding was constructed in order to hang protection over one of the important paintings. The material used is called Tyvek and is a waterproof fabric made from polyethylene fibres. It’s very light, but strong too. Protective covers are to be found all over the Hall but normal duties must continue in the hall as well. 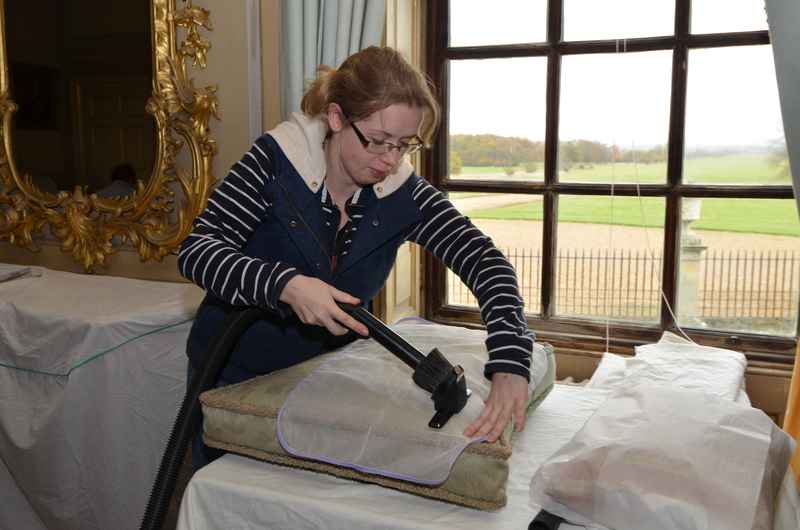 Below, we can see our Conservation Assistant Julia vacuuming for the Winter Clean. 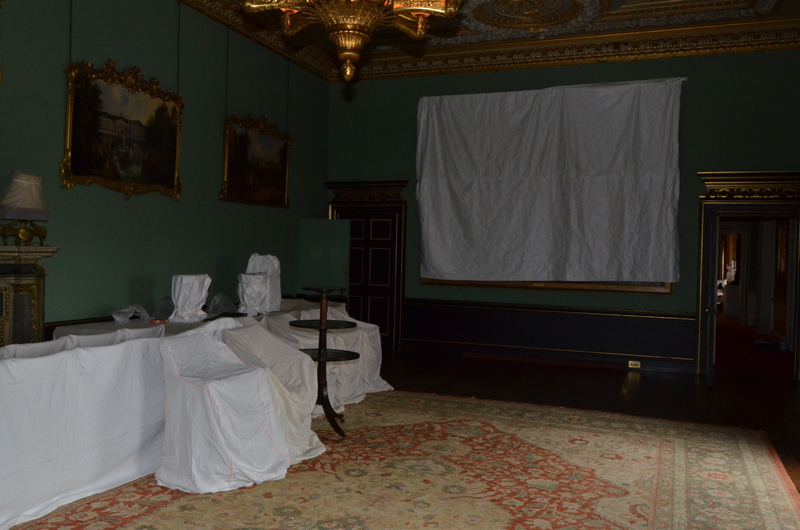 The deep clean of the Hall takes place in the Winter when there are less people around and longer periods of time can be devoted to it; it is essential to the conservation work. Julia is removing the dust from one of the chair cushions in order to prevent it from wearing away at the fibres of the fabric. The vacuuming itself is done through a nylon gauze. This is the same for all the textiles and it just prevents abrasion to the fabrics that are being worked on. All sorts of things go on behind the closed doors of the Hall in winter. One important aspect of maintaining Wimpole, is to ensure all the records are up to date. Meet Leslie Hoskins! She has been looking at the wall paper throughout the Hall. She’s been taking photos, and taking samples. 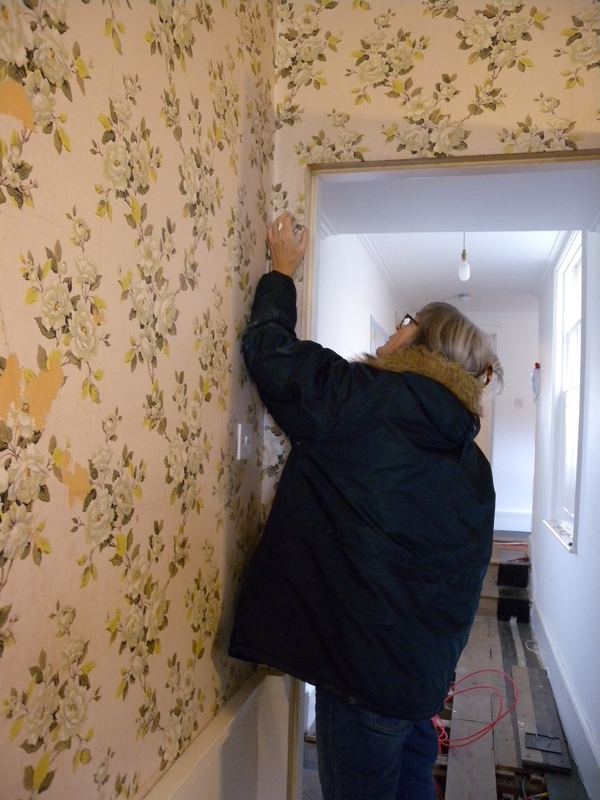 She’s dating all the old wall paper for the Hall team and contributing her knowledge to the sample records that they keep. 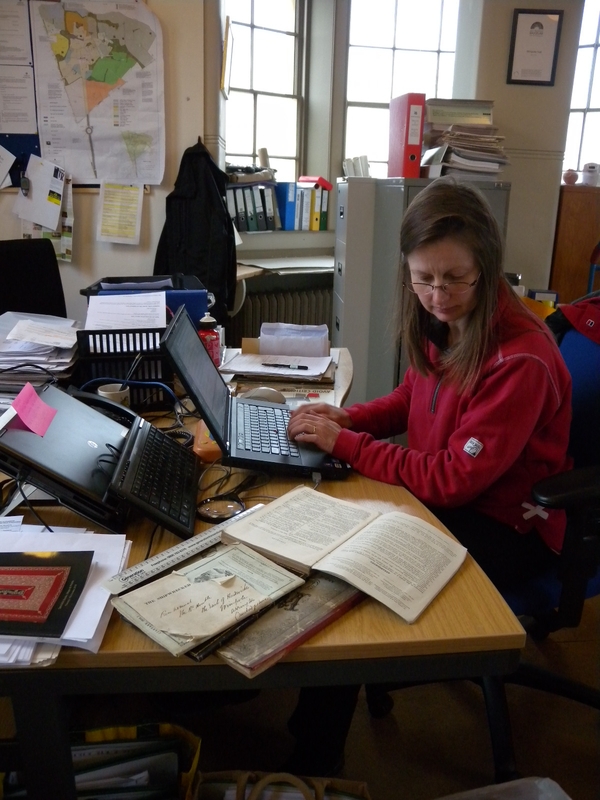 Yvonne is the Assistant Libraries Curator and has been busy cataloguing a new acquisition of books and papers owned by the 4th Earl of Hardwick who lived in the Hall during the 19th Century, from 1834 for nearly 40 years. He was an Admiral and known affectionately as ‘Old Blowhard’ because of his naval background. The documents include his Great Exhibition catalogue of 1851 and Navy lists for 1796, ’97 and ’98. Navy lists are a document of those who were serving on each of the Navy’s ships and these particular ones are not held in any of the National Trust’s libraries! So it’s a pretty important task! 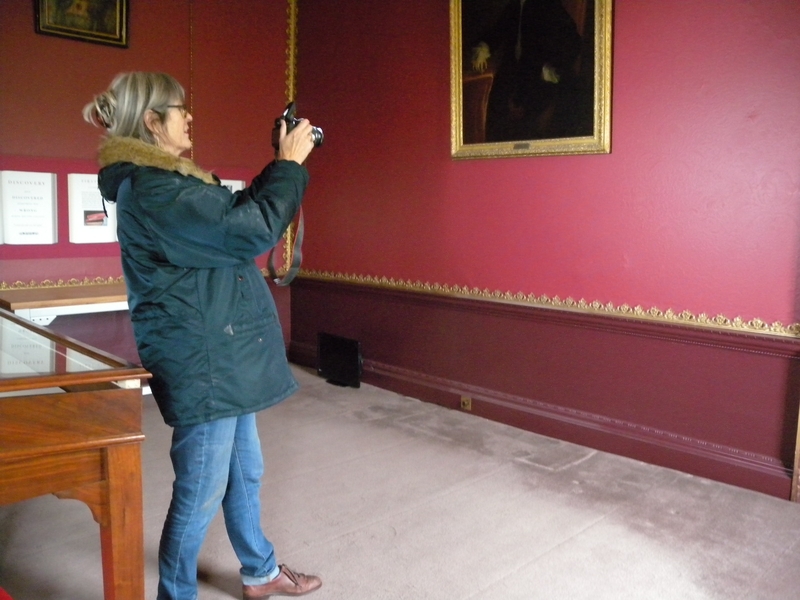 This entry was posted in Conservation, Mansion and tagged cambridgeshire, collections, conservation, Earls of Hardwick, hall, libraries, packing, protected, wimpole by luciackersNT. Bookmark the permalink. Fascinating insight into your conservation work and those naval records sound amazing. I’d find it difficult to stop myself from reading them as I’m cataloging. Haha. It is interesting stuff, we’re very lucky. There was some more great finds under the floorboards last week too!